Does eating unripe, green fruit make you hungry real fast after, give you a stomach ache, hurt your teeth, cause stomach gas, bloating, diarrhea or other side effects? All of these and more are common symptoms of ingesting unripe fruit and can engender extensive digestive discomfort. Even more, if you drink water along with the green fruit or combine them with other problematic foods or beverages like milk or coffee, your symptoms might worsen considerably. Eating unripe fruit is to be avoided especially on an empty stomach, if you are pregnant or are suffering from other medical conditions like gastritis, diabetes or irritable bowel syndrome. Why is eating unripe, green fruit bad for you? There are a number of reasons why unripe fruit is bad for your health. Some you can’t eat because they are hard to digest when unripe. For example, an unripe peach, quince or berry will be hard to chew and just as difficult to digest. Some are irritating on the mouth and stomach, like green persimmons which make your mouth dry and pucker from the astringency or unripe pineapple. Green, unripe apples, cherry plums or citrus fruit will have the same effects. Some fruits like unripe tomatoes contain glycoalkaloids that are mildly toxic, especially if you eat the tomatoes raw and in large amounts. Unripe pineapple is also toxic for people and examples can go on. 1) Stomach ache. The simple truth is that unripe fruits are difficult to digest. It’s hard to chew them as they are hard, even stringy in texture and take longer to digest. Think about quinces or really unripe pineapple, peaches, apricots or cherries: their flesh is hard, difficult to bite into and eating them is hard on the stomach, resulting in all sorts of symptoms, from stomach rumbling to diarrhea and abdominal pain. This is because without ripening, they are in a way less digestible and their nutrients are less available to us, so naturally you could experience stomach ache. 2) Gas, bloating and abdominal cramps. Unripe fruits are actually less digestible because they have not yet undergone the natural ripening process that makes their nutrients and the fruit themselves perfectly edible. For example, an unripe fruit will contain more complex carbohydrates that are harder to digest, such as starches that are more resistant to digestive enzymes. These complex carbs in a way behave like dietary fiber, indigestible plant material, simply because they are more difficult to digest. So unripe fruit basically lack the natural ripening process that helps break down fiber and other elements and make them more bioavailable and easier to digest. And because eating unripe fruits is like eating lots of fiber, you can experience side effects such as stomach gas, bloating and possible abdominal pain if you eat too much of course. 3) Diarrhea. Why does eating green fruit cause diarrhea? Because the carbohydrates in the fruit are less digestible and, in a way, act like dietary fiber. This means that eating too much at once can over-stimulate the intestinal wall, increasing bowel movement frequency and causing loose stools and diarrhea. See What to Eat When You Have Diarrhea. 4) False sensation of hunger, stomach sounds. Have you ever asked yourself why eating unripe, green fruit makes you hungry right after? Even if you didn’t feel a particularly strong hunger sensation at first, even one green apple or a few unripe plums can make you stomach rumble with hunger. Most of the time, this is not a real hunger sensation, but rather indicates an increase in digestive activity, presumably the digestive system trying to break down the rough fibers in the unripe fruit. If you wait it out, you might actually not feel hungry after. It can also indicate the stomach is feeling irritated by high amounts of complex carbohydrates, fiber and citric or malic acids in the unripe fruit. Or the noises could hint at an intestinal blockage. But usually you feel hungry right after eating ripe fruit because the ripening process increases their sugar content and makes fibers more tender, meaning you digest the fruit faster and feel hungry again soon. 5) Nausea and vomiting, loss of appetite. Unripe fruit are hard on the stomach and some people are more sensitive to their effects than others. This is why they may experience nausea, vomiting and even loss of appetite a few hours after eating an unripe fruit. This can continue the next day and simply prevent you from eating anything. The reason why this happens is because you’ve fed your stomach something rather indigestible and its trying to deal with it as best as it can and until it gets it out of the system, you can’t do much about the symptoms, except see a doctor if symptoms get worse. Green bananas, mango, papaya can do this to you. Also read Are Unripe Bananas Bad for You? 6) Teeth sensitivity. Why does eating unripe fruit hurt your teeth? Most unripe fruits are sour-tasting and astringent as a result of natural compounds such as citric acid in citrus fruit, malic acid in apples, quinces, plums, cherry plums, berries, grapes, tannins in persimmons and others. The unriper the fruit, the higher its content of puckering juice. These compounds that give fruits their sour taste are erosive in nature and can eat away tooth enamel over time, hence the reason green fruits can cause teeth sensitivity (also read Why Warm Lemon Water Is Bad for You). 7) Irritating and potentially toxic effects. Fresh fruit are considered the epitome of health, but not all are good for everyone and not all are healthy to begin with. In their unripe form, some fruits are actually bad for you. For example, unripe pineapple and its juice have toxic effects and often cause severe diarrhea, stomach ache, vomiting and other symptoms. Unripe pineapple is quite difficult to digest and can lead to bowel obstruction if not chewed properly. Unripe tomatoes are also mildly toxic, with some people being more sensitive to them than others, especially if they eat them raw. Physalis, or the Chinese lantern berry, belongs to the same family as tomatoes and is unsafe to eat unripe. Some fruits have an irritating effect if eaten unripe. From citrus fruits to mango, papaya, pineapple and green plums or apples, many can irritate the stomach lining, especially if you have existing digestive conditions such as acid reflux or gastritis. Eating unripe lychee is dangerous for diabetics because the fruit can cause sudden drops in blood sugar levels (for more information on various fruits benefits, side effects and uses, see fruits table here). 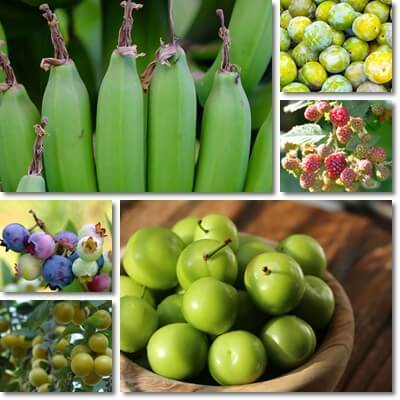 Green, unripe fruit and pregnancy. A severe bout of diarrhea from eating unripe fruits can, in some situations, create a potential for miscarriage by causing dehydration, weakness, dizziness, fainting, abdominal cramps. Some unripe fruit like lychee can cause drops in blood pressure that could potentially create a shock that puts the pregnancy at risk. Other fruits may be mildly toxic. It is important to understand that unripe, green fruit do not have the exact same profile of biologically active components and will have different health effects than the ripe fruit. Overall, it is best to avoid them during pregnancy. Conclusion. Proper fruit ripeness is important for good health and good nourishment. Ripe fruits generally have a better nutritional profile, higher antioxidants content and are generally more suited for consumption in the sense that they are easier to digest, whereas unripe fruit may contain certain elements with mild side effects, toxic potential or irritating action. Overall, eating unripe fruits is generally bad for you and can result in heartburn, acid reflux, stomach ache, diarrhea, nausea, vomiting, loss of appetite. Pregnant women in particular should avoid them because of their potential to be unsafe during pregnancy.